Shows the speculative 'River of the West'. A New Map of North America, agreeable to the Latest Discoveries. 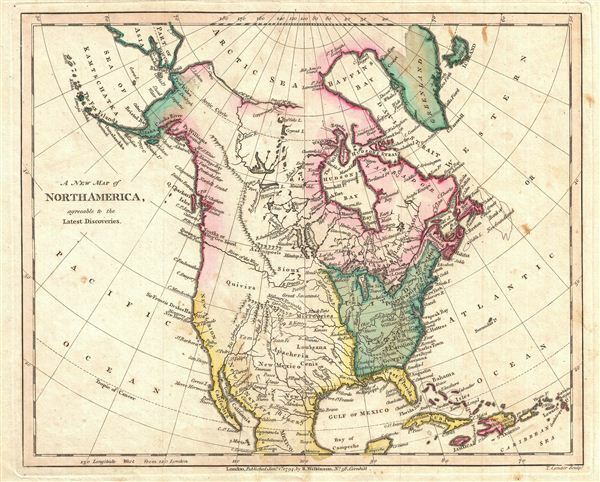 A finely detailed first edition 1794 map of North America by Robert Wilkinson. Wilkinson's map covers the entire continent of North America from the Arctic Sea to Mexico and from Atlantic to Pacific. This map bears the signature of three monumental events that occurred in the fifty years previous to its publication: the conclusion of the American Revolutionary War and the founding of the United States; the successful exploration of Alaska and America's northwest coast by Captain James Cook; and the remarkable overland treks by Samuel Herne and Alexander McKenzie to the Arctic Sea. each of these events served to redefine the continent's geography. The United States here appears in green, with the original thirteen colonies noted. Cook's exploration of the Northwest Coast finally filled in one of the last blank spots on the map. Though Cook's navigations did not resolve all doubts about this region – these would be left for Perouse and Vancouver – his work was nonetheless one of many nails in the coffin of the Northwest Passage. The other great nails which would finally end all hopes of a navigable water route across North America were the overland treks of Herne and McKenzie. Both explorers made their way from lower Canada into the high Arctic, failing in the process to discover any trace of the great river ways speculated by hopeful european cartographers of the previous decade. Wilkinson has color coded his map according to political influence. The United States is green, British Controlled Territories are in Red, Spanish America is Yellow, and small stretch of Russian America appears in Blue. All of the lands west of the Mississippi, with the exception of english claimes in British Columiba, are accorded to Spain. Numerous American Indian nations, including the speculative Kingdom of Gold, Quivara, are noted. Quivara, vainly sought by the conquistadores de Soto, Coronodo, and others, appears bounded by New Albion (the english name for upper California as applied by Sir Francis Drank in 1578), the Colorado River, and the speculative River of the West. The River of the West itself excites considerable interest. Appearing on maps of the middle to late 18th century, this river, which supposedly let out into the Strait of Juan de Fuca, was believed to be a potential river passage from the interior of North America to the Pacific. Today many believe the River of the West was simply a speculative mismapping of the Columbia River. In the 18th century, however it was the great hope of the American fur traders just beginning to explore the region. Such a river, though not an effective route across the continent, would provide a highway for the vast American fur trade to offer its goods in the lucrative markets of Asia. Unfortunately, as they would discover in the subsequenty 50 years, the North American fur trade did not count on the Rockey's, the Great Basin, or the High Sierras. engraved by Thomas Condar for the 1794 first edition of Robert Wilkinson's General Atlas.